The engineering, architectural and design minds involved in expanding and modernizing Mariposa Land Port of Entry, a bustling processing center that inspects thousands of vehicles heading to the US and Mexico, wanted to create a cultural connection, instead of a division. The collaborators involved in the project, based in Nogales, Az., reflected in a video on their design and construction experience ahead of being featured this October in a special conversation held in conjunction with AIA Arizona. Architects, contractors and manufacturers shared details on the challenges they faced in modernizing one of the busiest land ports of entry into the country. The group also emphasized the importance of teamwork from the gecko. Vendor MLPOE produced the video featuring Mariposa, which was selected as a case study for the Central Arizona AIA convention in downtown Phoenix on October 6. Mariposa was built in the seventies, and by 2014, it was in need of a major upgrade to meet updated security needs and to accommodate higher levels of activity, alleviating traffic troubles. The renovation, designed by local architecture firm Jones Studio, sought to balance openness to nature with the need to create a closed, secure and bullet-resistant space. In addition, the firm sought and obtained LEED Gold certification, meeting its goal of offering a healthy, energy-efficient workplace in a welcoming, modern atmosphere while providing high security. Visual connections to lush surrounding gardens were a significant element of the design, despite the building’s location in the midst of a desert landscape on the US-Mexico border. About one million gallons of rainwater are collected on-site and used to maintain the greenery that offers beautification and purification to workers, officers and visitors alike. Mariposa was in need of a major upgrade to meet updated security needs. “The interior space has a glazed wall,” Farling points out, “and then a Hunter Douglas ceiling where the lines of that ceiling sort of take your eyes out to the garden space,” helping to emphasize the stress-alleviating elements of nature. The system also serves as shade trellises in some outdoor zones past the building envelope, offering comfort to those traveling on foot in the hot climate. 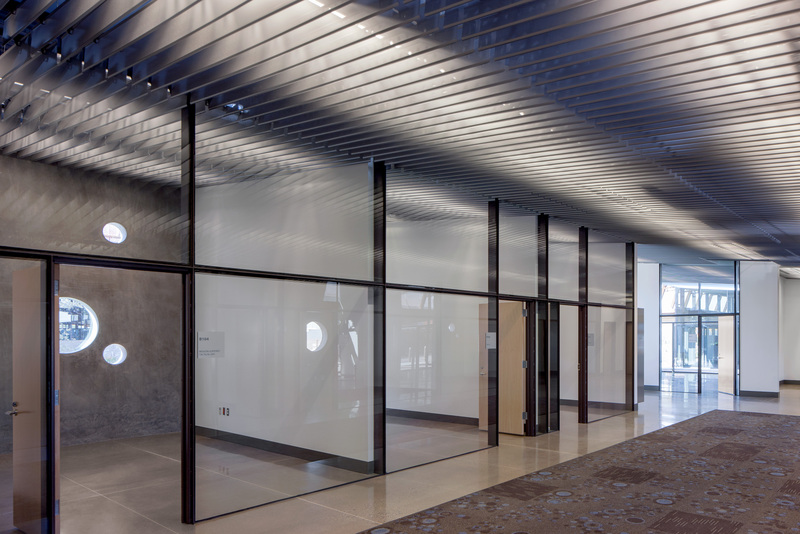 Tony Evans, of Lanton Architects, worked with Hunter Douglas Architectural on the perforated metal fin ceiling system. 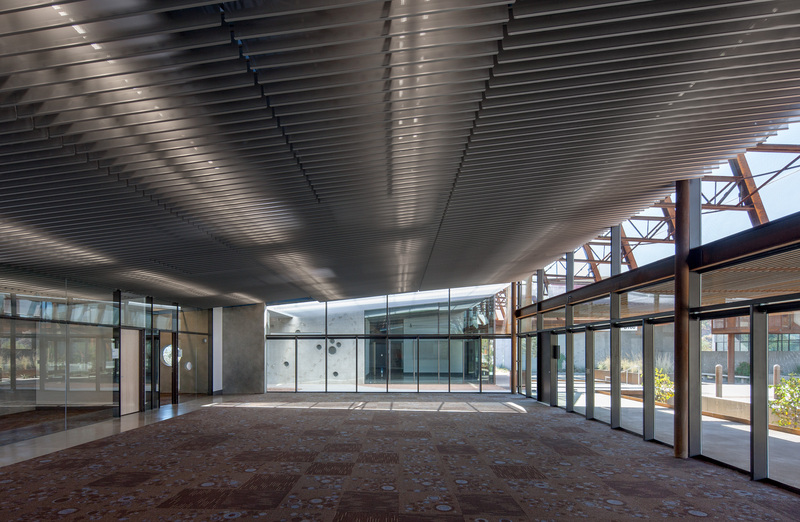 It was used to create a louver that allowed lights, diffusers, sprinklers and AV systems to be grouped together and stored out of sight, while providing for easy access and flexibility. 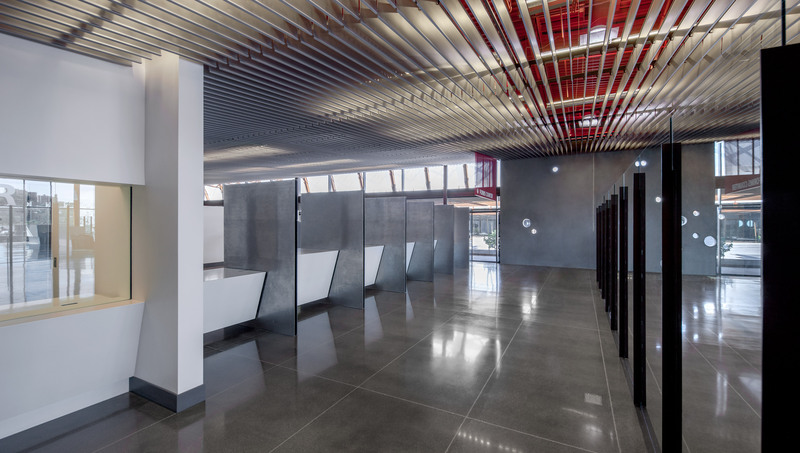 “The linear baffle systems were perforated, they were custom-designed in the Netherlands at Hunter Douglas’ plant over there,” Wayne Turcotte, of TP Acoustics, the subcontractor, notes. The firm Jones Studio sought and obtained LEED Gold certification. 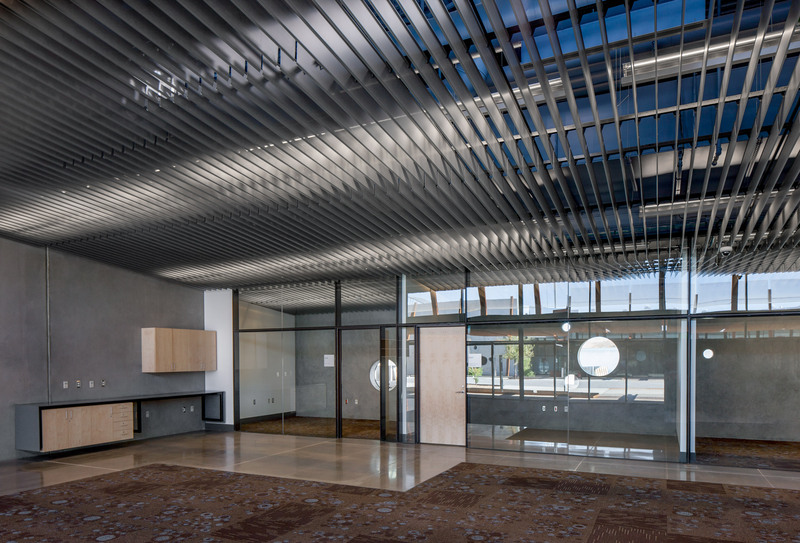 The perforated metal fin ceiling system created a louver that allowed lights, diffusers, sprinklers and AV systems to be grouped together and stored out of sight. Mariposa was selected as a case study for the Central Arizona AIA convention in downtown Phoenix on October 6. Watch the video to hear more about the alkaline-resistant connectors used on the unique exterior wall, which were twice the strength of steel. 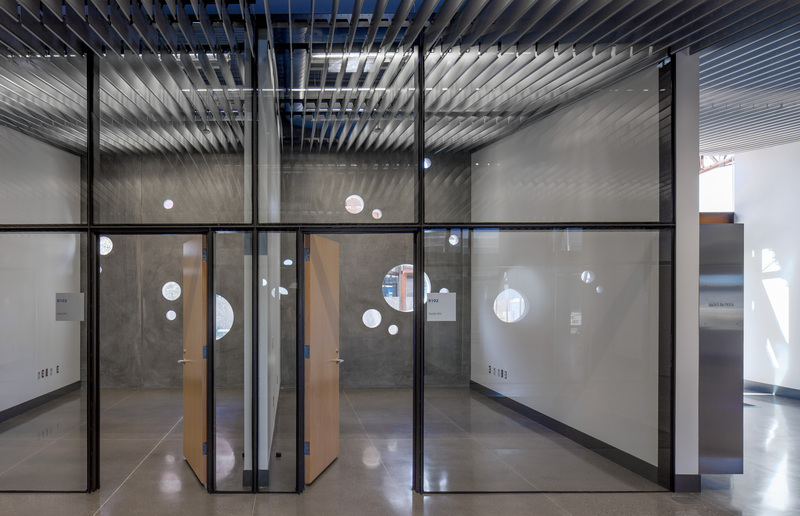 The team also details how they met the unusual design challenge of including pathways of footprints across the exterior wall with a heavy sandblast texture (hint: they ordered “boxes and boxes of rubber-soled shoes” and cast them). Bain says the overall impression of the footprints truly evokes someone traveling through the Port of Entry. 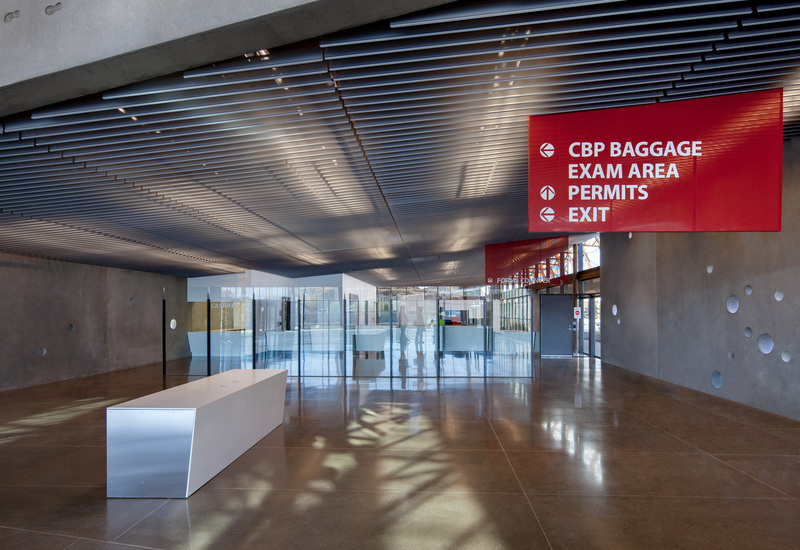 Mariposa Land Port of Entry with Jones Studio will be featured in “Lessons Learned 1” at the 2017 AIA Arizona State College Conference on October 6 at 10 a.m. The conference will be led by Debbie Millman, of the New York-based “Design Matters” podcast.